We asked you last week how much do you think Samsung will charge for its unique foldable device that will sport a 7.3" screen when unfurled, and just 9% think Samsung will go all-out with a price tag higher than $2000. This may indeed make it dead on arrival, but 47% of you are of the opinion that the foldable Samsung phone may even fit in the up to $1499 range that is currently reserved for souped-up flagships with up to 512GB storage. Almost as high is the amount of responders who think that Samsung will charge a premium over the current "rigid" flagships, and fit its unique foldable handset in the $1500-$2000 range. While the lower tag may be based on wishful thinking, the higher range sounds more realistic, considering the amount of R&D as well as component costs that Samsung will have to bear. Chinese phone makers like Huawei, Xiaomi and Oppo, are actively pursuing their own foldable phone designs, and it's Xiaomi, in particular, that is scrambling for the title "world's first," even though Samsung and Huawei are farther ahead in their research on the matter. 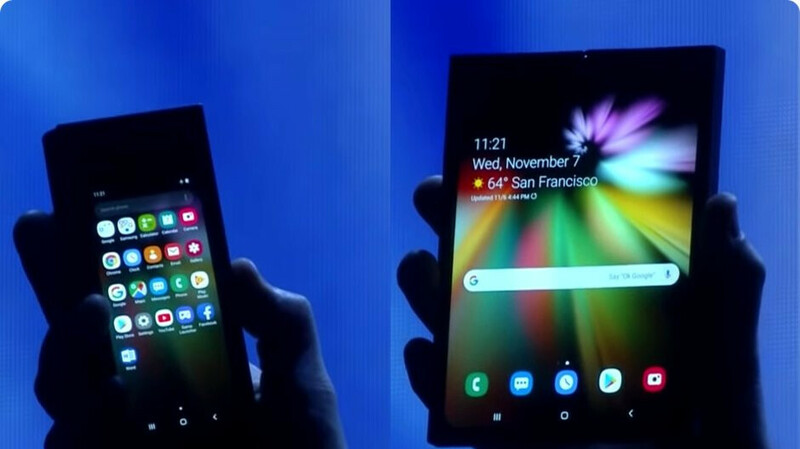 Samsung is so far ahead of everyone, in fact, that it actually showed a prototype on stage the other day, and said it will be using its Infinity Flex display into a retail foldable phone next year. It has been toying around with the concept for years and is fast-tracking it now to ease the gloom of the transitional 2018 where the Galaxy S9 was used as a stop-gap measure on the way to the 10th anniversary Galaxy S10 with unpleasant consequences for the bottom line of Samsung's mobile department. While Samsung may be way ahead of everybody when it comes to a retail model of a foldable phone, Xiaomi is determined to use a different, out-folding design type to beat everybody to the punch, claim insiders, and couple it with a much lower price tag to entice buyers. An obscure Chinese company already demonstrated such an out-folding model recently, with a claimed price tag of $1300. Samsung's in-folding Galaxy X/F, or whatever it's called, is said to land at a cross-section price of 2 million won ($1800), while the eventual ones from Xiaomi or Oppo are tipped to cost a million won, or about $900, by utilizing a flexible panel made by LG. That's half as the rumored price of Samsung's foldable phone which is speculated to cost anywhere in the $1500-$2000 range, or even more. During its foldable phone Q&A session at the Developer Conference the other day, Samsung's presenters said that they will try everything possible to release the Gumby phone at an "appropriate" price, whatever that means. How will Samsung price its foldable phone? I saw an article that claimed it would be priced upwards of $1700. I didn't read it, but I just wanted to point out that estimates for the price aren't very optimistic. These would make $1000 phones (XS, Note 9) seem affordable. That is basically the state of the current smartphone market though. Mid range phones are definitely the sweet spot right now. You should only buy flagship devices if you regularly use its features (Such as the S-Pen on the Note 9), or desire the more premium build quality and design. Give that foldable phone an 8gb ram, 256gb base storage + sd card slot and a huge battery for $1,200 and I will still see it as affordable. Doesn't matter how they price it. Sales will be much lower than expected and hoped, and the price will literally "fold" by 50% shortly after release.